Linking market research to marketing strategy? Client-side researchers sometimes feel that they are constantly being asked to justify the value of research insights. A frequent challenge from management is how can we measure the benefits of insights and what specific decisions have been driven by research. Ideally management would like to understand how research links to either sales or costs. Demonstrating how insights have led to specific decisions can be particularly challenging when you work in a large, hierarchical, multinational organisation where the management structure appears to be in a constant state of flux. That’s why it’s important to spend a significant amount of time engaging with stakeholders to understand their problems and offering advice on how research can support their decision making. Once a project is commissioned it’s somewhat of a relief that you can get on with implementing research. However, to ensure insights are linked to strategy and decision making it is essential that you integrate action planning into the market research process. Without such a mechanism in place there can be no assurance that management will use the insights to support strategic decision making. It is very easy to ignore insights, particularly if they don’t agree with your own opinion! Ensures the researcher retains ownership of the findings and how they are used. This is important as the client-side researcher is best placed to advise on interpretation of results when management drills down to a granular level of action planning. In addition it raises the profile and credibility of the client-side researcher within the organisation. Provides greater visibility and evidence of how research findings are used and the value it adds to the organisation. This is invaluable when trying to negotiate budgets and agree on priorities for future research spend. Enables the researcher to engage with a range of stakeholders and gain a greater understanding of how findings influence and drive strategic and tactical decision making. Allows the researcher to work more closely with operational areas that have responsibility to implement actions generated by research. Set expectations at the beginning! If you introduce it as best practice before you start work on a project you rarely meet resistance to the concept. Ask a senior stakeholder to sponsor the action planning process and obtain agreement of who will take ownership of actions within individual areas or departments. Include action planning in the research brief or plan. Outline any potential involvement you require from the external research agency. Propose that you act as a consultant to implement the process as you have the best understanding of the organisation and culture. However, agree with the agency how they can assist and have input into the process. Consider how the research and the action planning may relate to key strategic or operational initiatives. Discuss any potential conflicts or implications with the senior stakeholders before proceeding with the research project. This will ensure that the research and action planning either feeds into the initiatives or avoids overlapping. Soon after the debrief meet with the stakeholders to agree which insights the action planning workshop should address. You should set the agenda by identifying beforehand the priority insights and how best to approach them in the action planning workshop. 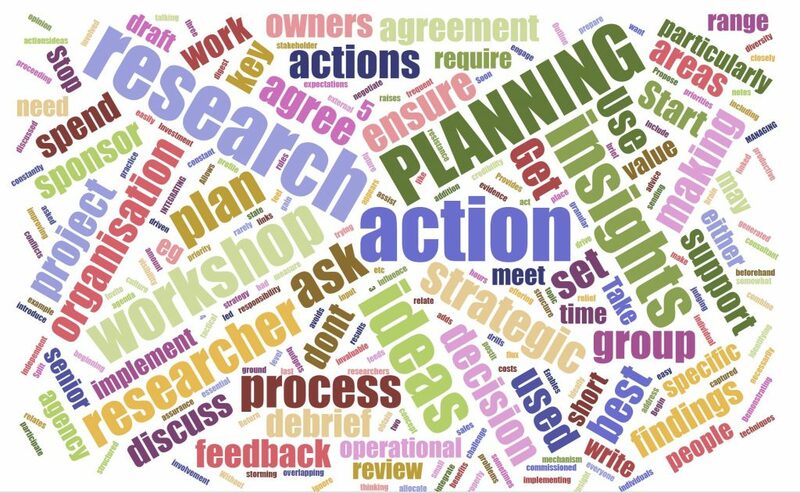 Don’t combine the research debrief and action planning workshop. Management need time to digest insights from the debrief and an action planning workshop can easily last for two to three hours to properly consider implications and actions. Ask attendees to prepare for the workshop by sending them a short summary of the research. Get them to write down potential actions/ideas to discuss at the workshop. Invite people from a range of areas, including departments not necessarily involved in project to provide some diversity and independent thinking. Set some ground rules, e.g. no bad ideas, no judging ideas, want everyone to participate, use post-it notes to write down ideas when other people are talking, all ideas to be captured etc. Use relevant brain storming techniques to make the workshops engaging and productive. Begin with a short summary of the key insights that will be discussed during the workshop. Split the attendees into small break-out groups of 4 or 5 individuals and allocate a topic to each group. Provide each group with a structured approach to discuss their insight. For example if the research relates to improving customer service or experience you could ask them to generate a list of things we need to stop, start and continue doing. Ask them to spend 5 minutes at the end prioritizing their actions in each category. Ask each group to feedback their top 3 ideas for each category (e.g. Stop, Start and Continue), but capture all the ideas by taking away flip charts used during the break-out groups. Quick wins that could be implemented with little or no resource. Medium term ideas requiring some resource or support. Longer term, strategic ideas that may require significant resource or a change in policy. Circulate the draft action plan to attendees and ask for feedback and comments by a set date. Take your sponsor through the draft action plan and get their feedback and agreement to seek owners for each action. Get agreement from action owners how the action plan will be kept up-to-date with progress and developments. Have update meetings with your sponsor and key action owners to review progress. This can be used to ensure the plan is still relevant and whether it needs to change to respond to any changes in strategic direction. It is important to review the plan on a regular basis and feed in new insights from more recent research. Whilst I was in the process of writing this post I came across an excellent article on the Green Book blog by Edward Appleton; Should Researchers be more like Advertising Planners? This suggests that market research needs to put more emphasis on tangible value-added outputs to respond to the changing nature the world of insights. For some client-side researchers this may require a step change to ensure they are at the heart of the action planning process. Thank you for reading this blog. I hope it generated some ideas for managing your research action planning. I would also like to thank Lisa Radin (@milguy23) for her feedback and assistance in writing this post. This post has been published on the GreenBook Blog market research website.